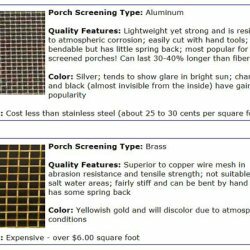 Welcome to our Screened Porch Design topics - an extensive hub from which you can plan, design, build, and decorate your porch enclosure. 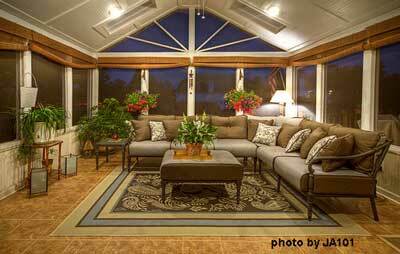 In collaboration with custom screen porch builders, Mary and I have assembled an array of information and pictures to give you oodles of screened porch design ideas. The two of us love screen porches - so much that we actually bought a home just for the porch. 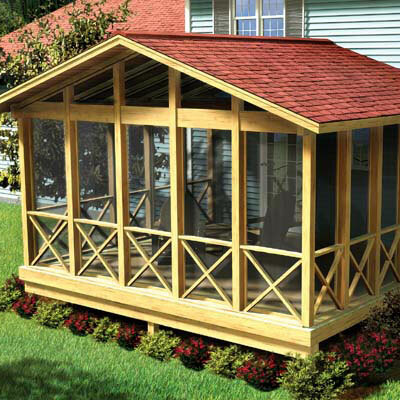 A screen porch not only gives you additional living space but also allows you to enjoy the outdoors in comfort. 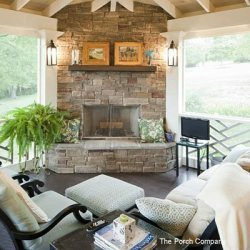 From screened porch design to screen porch kits, decorating, building your own, and more, we have covered about every aspect of fine screened porches. A screened porch design can range from the simple to the very unique. That's what makes it such a great addition to any home. 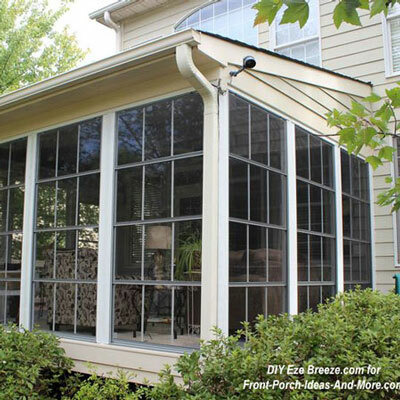 Add a few additional features and you can use your screen porch almost year round depending on where you live. 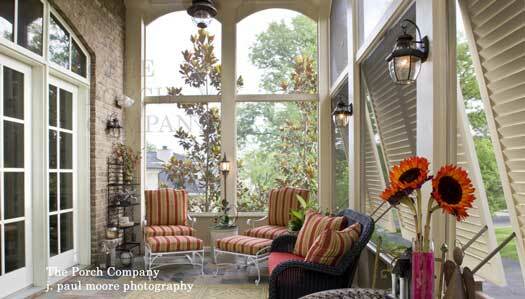 Wonderful option that turns your porch into a screened porch /three-season porch. Less expensive than glass. 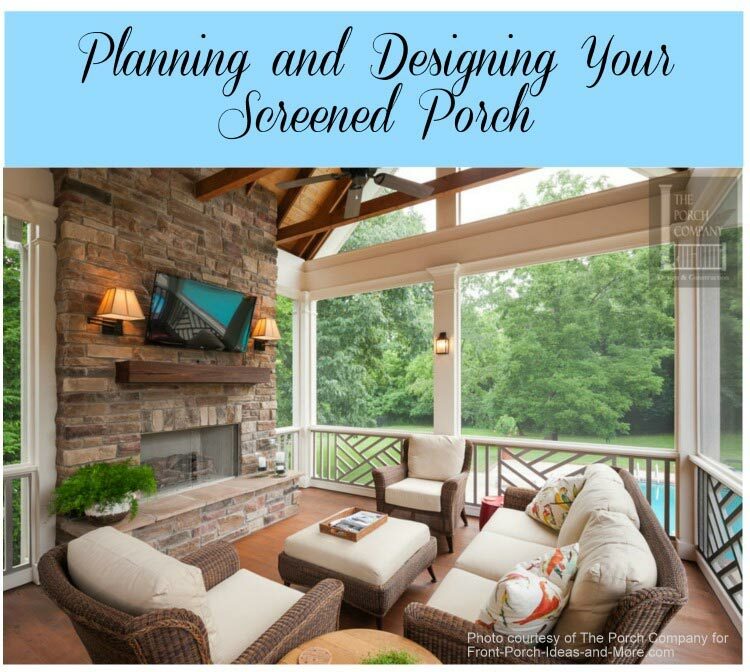 A gallery of photos along with detailed info for planning, designing & decorating your screen porch - a must see! 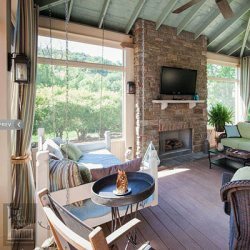 See six options you can use for building your screened porch - from the ground up to kits and custom builds. Increase your living space instantly with kit options to suit your family and budget. Walls only or entire assembly. Four season porch options are ideal for added living space while simultaneously creating an amazing outdoor room. 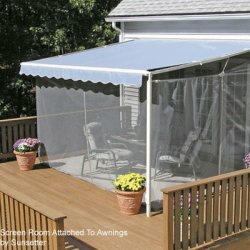 Already have an awning over your deck or patio or are planning to get one? Why not screen it in? don't forget about the roof lines, railings and skirting. 10 planning factors you need to know from eave restrictions to traffic patterns. You'll be well informed. 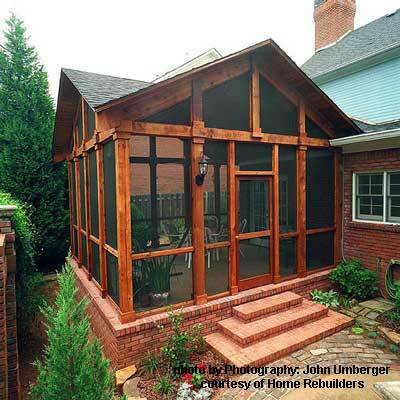 Things you should know if building a screen porch from a plan. Includes info on electrical wiring, floor and roof plans, plumbing and more. 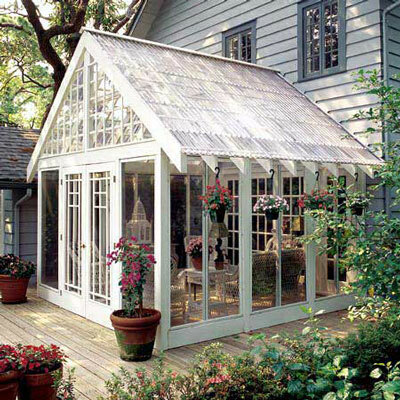 Screen porch plans that are popular with our readers. 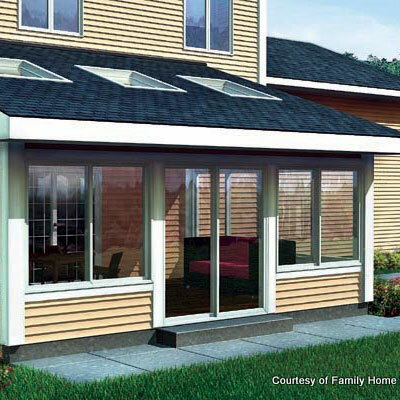 Create an amazing screen porch for your family. 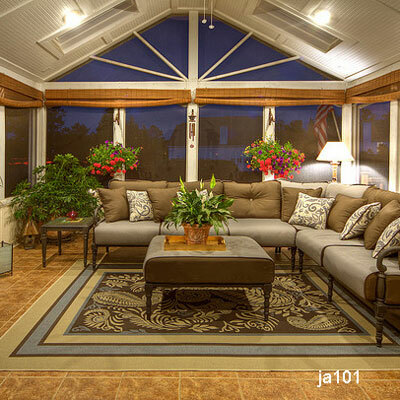 See how you can easily convert your existing space into a fun light-filled sunroom. Love screen porches? Listen to our audio programs with leading experts on screen porches. 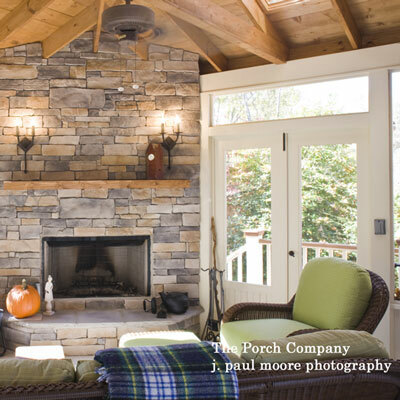 We interview Nancy Moore, owner of The Porch Company, to learn how to design the perfect screened porch! You'll learn why you must think about water, why choose an experienced porch builder, and what one factor should be used to determine the perfect size of your porch. 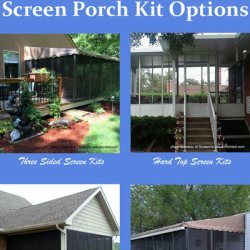 In need of a screen porch kit? Listen to Glenn Smith of Screen Houses Unlimited, who shares information about all kinds of kit options. 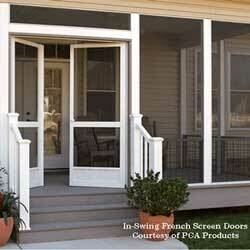 Want to update your screen door? 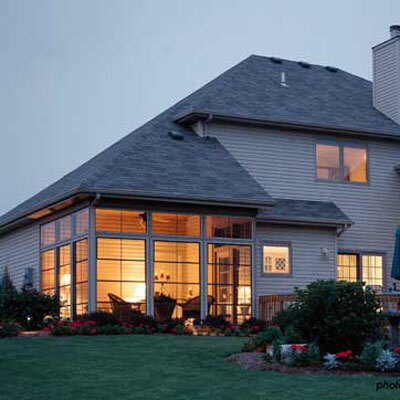 Steve Pfeffer, President of PCA Products, explains the advantages of their aluminum screen doors. The major error most people make with their screened porch design is size. Most people make them too small and wish later they had made it a just a "little" larger once they begin placing furniture. Planning makes all the difference. Whether you are building your porch yourself, using a kit or hiring an architect or contractor, start with pencil and paper. 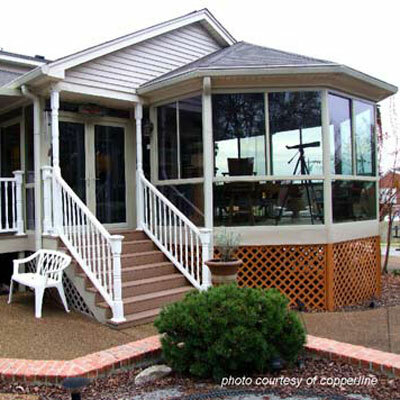 Your screened porch design should be given thoughtful planning. The screen porch pictured below called for a 16' X 18' screened porch with cathedral ceilings. Note the ceramic tile flooring and wainscoting on both the walls and ceiling. Multiple power outlets were installed in the walls and ceiling in addition to a cable hook up. Skylights were installed in the roof. 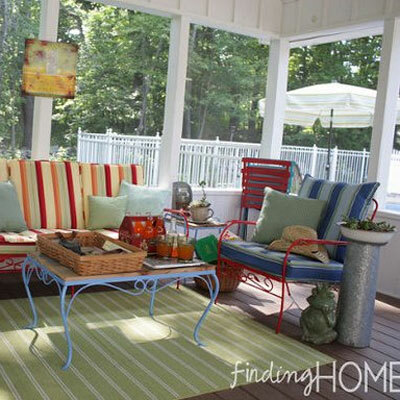 These are but a few of the many things you can have on your screen porch. 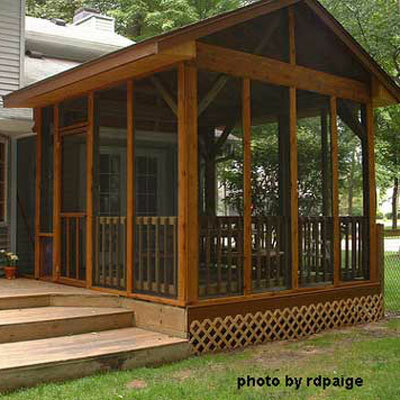 You can convert an existing patio slab, brick, or deck to screen porches easily. 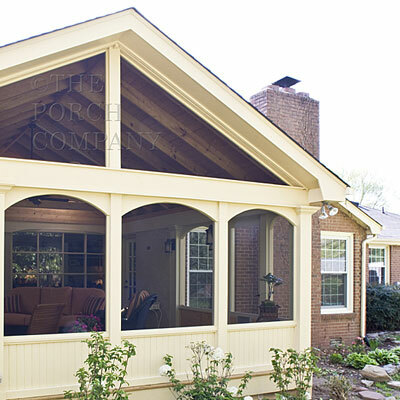 Enclose your existing porch or portion of your porch into a screen porch. Or, start from scratch and build it to your own specifications. Another great screen porch design idea is to use existing screen porch plans and modify them to suit your specific needs. 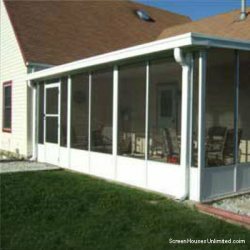 You can usually easily adapt your screen porch to a sun room by adding glass panels and perhaps a space heater depending on your climate. We did this in Nebraska and were able to use our porch almost year round! 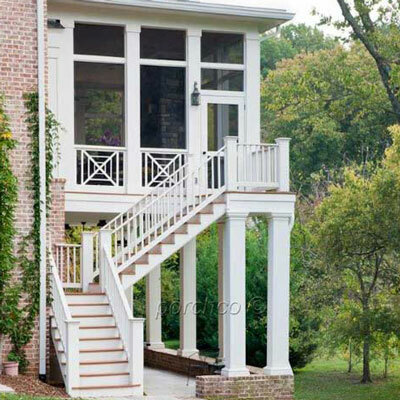 Another option is to have an architect draw your screen porch plans to your specifications. 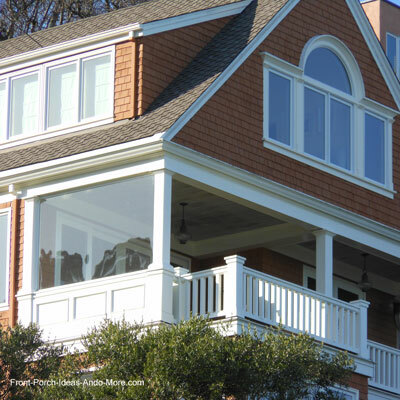 They will ensure it blends with your home's architecture to make your screen porch the envy of the neighborhood.